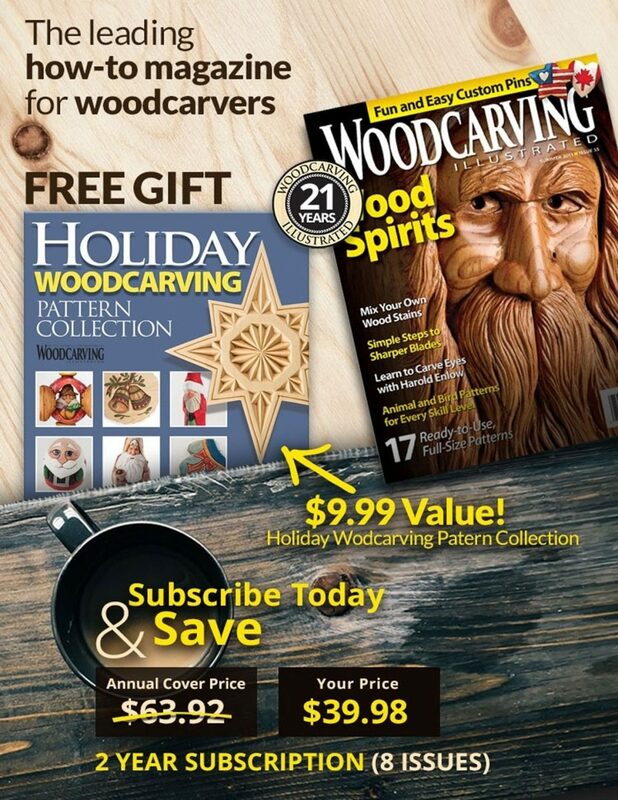 The composition for this carving was inspired by two events more than 40 years apart. The first was my service in the Navy from 1958-1960 as a torpedo man aboard the USS McCaffery. The second was an upcoming reunion with my shipmates where the carving would be my contribution to a fund-raising raffle. Before finishing this caricature, the United States was rocked by the September 11, 2001 tragedy. That’s when I decided to add the American flag to make the project more patriotic. 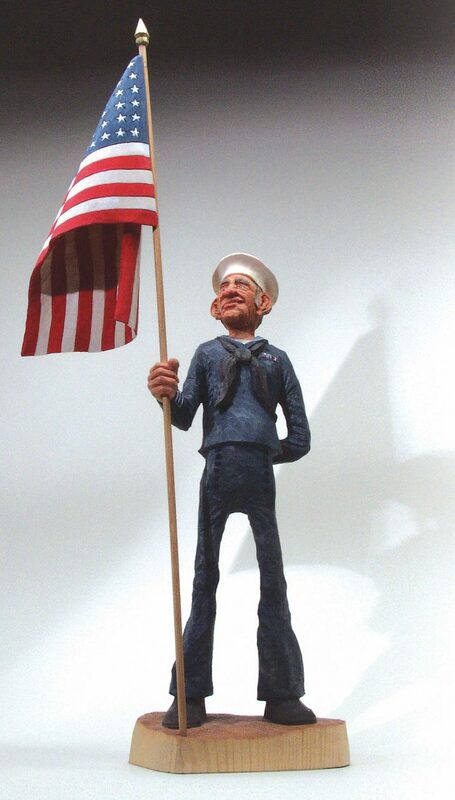 I first sculpted a clay model of the sailor. Clay offers a three-dimensional form from which to copy; it also serves as a model for establishing more animation than I might achieve otherwise with paper patterns and illustrations. While I’ve had many years of experience carving figures, the unfurled flag was something I had not done. To visualize how to carve it, I used a piece of heavy paper laid flat and drew the rectangle for the flag, adding the stars and bars. I then rolled the paper like a cone and folded and glued it to a dowel to have a model to study when I carved and painted. After bandsawing the cutout to shape, I started with a 12mm #9 gouge to rough out the two pieces. Then, I gradually worked on the details, not overdoing any one area. Making a lot of small cuts with gouges gives me a cleaner-looking surface. 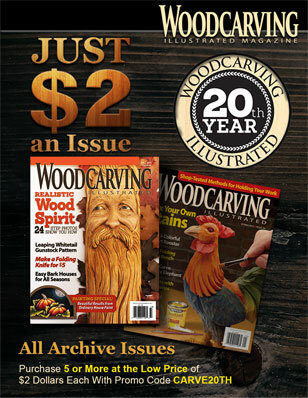 Typically, I cut across the grain a lot because basswood yields the desired cuts without splitting or chipping. For the inner part of the flag, I used a knife and several different gouges—especially no. 9s and 10s. I finished the inside with a fishtail gouge and the outside with a knife to make it smooth. I used watered-down acrylics for most of the project, keeping them on the light side so viewers can tell there is wood underneath. While colors can be darkened by adding more paint, they cannot be lightened. I did find that applying oil paints to the face and hands of the sailor allowed me to blend and texture colors to achieve more accurate skin tone. As I do with other carvings, I painted the face and hands first. These are areas that can be problematic and may take some time. To achieve skin tone, I mixed small amounts of yellow and red oil paints on plastic lids from cottage cheese and butter containers, playing around with the colors until the mixture suited my eye. The sailor’s uniform is an acrylic blue, but I stippled burnt umber under the arms and in other places where I wanted to create shadows. To highlight high spots such as where the shoulders and elbows stand out, I stippled with white, adding more water to the paint so the material looks stretched. To dry the acrylics quickly, I used a hair dryer. For the oil colors, I added a cobalt dryer, which helps dry the paints in a day. This additive is available at most hobby and artists’ supply stores. A few words of advice: Take your time and be as meticulous as you can with the painting. 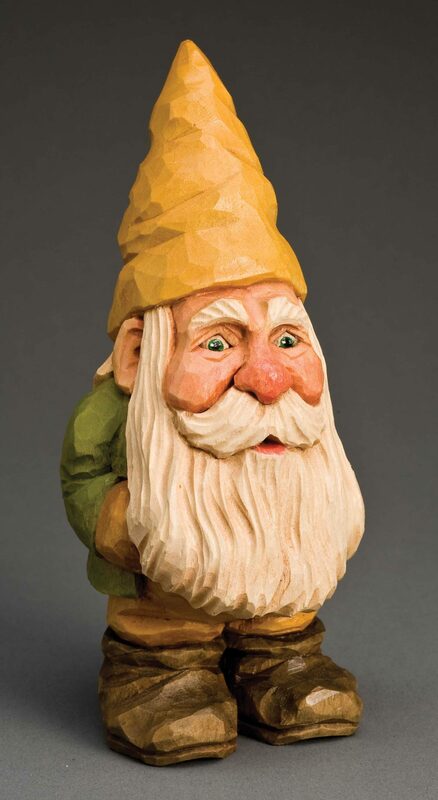 Poor painting techniques will ruin even a great carving. CLICK HERE to download the Sailor with Flag Patterns. 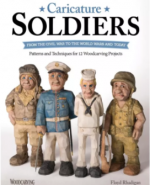 For more information on carving soldiers read Caricature Soldiers: From the Civil War to the World Wars to Today. Discover the creative art of caricature carving, and start making your own memorable versions of classic service personalities with award-winning carving instructor Floyd Rhadigan. The book is available at www.foxchapelpublishing.com for $14.99 plus S&H. 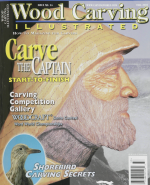 This article first appeared in Woodcarving Illustrated Fall 2003 (Issue 24).